Forrest got started with his soapbox racer headlamp. He later moved on to crystal radios and a lafayette radio. He was never a fan of tubes though. He started building hobby electronics in late 60s early 70s, such as a rocket control system. These landed him in publications like Model Rocketry Magazine . 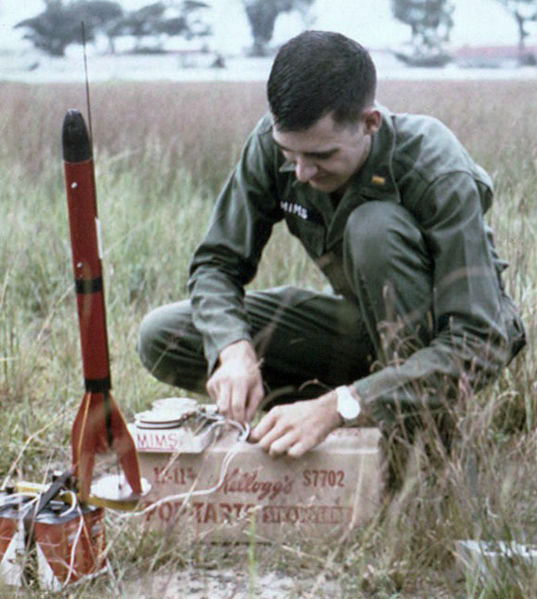 Launching rockets from the racetrack and the top of his apartment in Vietnam, he got into a little bit of trouble (especially when the MP came looking for attackers!). After the war, he founded Micro Instrumentation and Telemetry Systems (MITS) with Ed Roberts. This would later be the company that debuted the Altair 8800. Early fans of those computers included Paul Allen and Bill Gates, the former donating a bunch of the history to the New Mexico Museum of Nat’l History. There is a picture there of Forrest’s wife typing up the manual after Forrest wrote it. The reason the Altair got so much attention was because it was featured on the cover of Popular Electronics Magazine. This magazine had circulation of 400-600K people. It was edited by Les Solomon. Bill Yates wrote the article (note the ‘Y’, not a ‘G’). Forrest saw LEDs in Electronics magazine and contacted Dr Ed Bonnin at Texas Instruments. They cost $365 per LED! With the donated LEDs, Forrest built an infrared travel aid for the blind, which worked like sonor. In later projects, Forrest built a music box that had alien sounds and was featured on Johnny Carson. He left the air force and became a parking lot attendant at the airport. This is where he wrote his first book on LEDs. His second book was published by Howard Sams and Company and was about optoelectronics. When Forrest started writing for Radio Shack, Dave Gunzel encouraged him to model the books after his handlettered lab notebooks. Forrest tested circuits 4 times to make sure he didn’t miss anything or have bad assumptions. This lead to very low numbers of errors in the books where he did the quadruple checking. In 1988 he decided to make a proposal to Scientific American to write for the Amateur Scientist column. He wrote for them for just 3 issues due to conflicts with the publisher. Each year he travels to Mauna Loa in Hawaii to calibrate his equipment. Forrest’s research clashed with results from a NASA sattelite. Once NASA found and corrected their mistake, the research landed him a publication in Nature and the Rolex Prize. Forrest Mims, 1993 Rolex Laureate from Rolex Awards for Enterprise on Vimeo. After collaborating, Forrest and Brent Holbin (an atmospheric scientist with NASA) published a second paper in Nature, this one about UV monitoring. These days, Forrest is interested in making music from data. He is also the inventor of the Atari Punk Console, a popular project for hobbyists. A listener wrote in about how hobbyists are making replicas of the Altairs. Forrest likes that there is still so much interest. Forrest wrote a book about his experience in the industry called Siliconections (1986). He also wrote a TON of other books! Radio Shack dropped the books and the electronics followed (2003ish). However, the electronics learning labs will be back in stores this year. The resurgence in hobbyist electronics really excites Forrest. He says, “The Maker Movement is phenomenal” and has a column in MAKE Magazine. He is also a fan of Nuts and Volts magazine. All of Forrests’ kids were into science. Based upon his daughter’s experience with the robotics club and associated competitions, he is proposing a new type of robotics competition, based on the idea of a Mars Rover type of simulation. The vote is in: Forrest says “Five Fifty Five”. See what other listeners voted for on our survey many moons ago. Forrest thinks Hans Camenzind did a great service by inventing the 555 timer and is also a fan of Hans’ book. Hans sadly passed away last year. You can find Forrest online on Twitter at @fmims, on Facebook under Forrest Mims III and on his website about his science research, ForrestMims.org. Many thanks to this living legend for being on The Amp Hour! Image courtesy of Wikipedia. Don’t forget to donate! Awesome Interview and all I can say is that I give credit to Forrest M Mims for getting me to this point in my life as a Student in Electrical engineering. I hope to hear him again on the Amp Hour in the near Future. Best interview yet. So interesting and you guys did a great job just letting him talk. Great show but guys, let your guest finish a sentence every once in a while! We had some bad delay on my line this time, so when I thought it was ok to talk, it turns out Forrest or Chris were still talking. Haha, “capacitator”. I’ve had so many students say that. I very much enjoyed this episode of The Amp Hour. Sounds like Forrest and I are in a similar age range. My mom and dad got me my first multimeter (VOM) at age 11 in 1961. My dad felt compelled to get this so I would stop borrowing his. I also was not attracted to Engineering school. I wanted to touch components. I didn’t want to go to 2 years of classes before I got into electronics and I didn’t see a need for all that math. But I ended up working for >30 years in electronics, designing medical electronic products as an engineer. I learned some from school and some from reading magazines, starting out with Popular Electronics, Electronics World, Radio-Electronics and moving to trade magazines Electronics, EDN. I got my hands on every databook that I could and learned plenty from the Radio Amateur’s Handbook. I am glad that the hobby seems to be coming back. You should try to get Don Lancaster on your show (www.tinaja.com) He wrote many books which I used extensively, such as The TTL Cookook, The CMOS Cookbook, The Active Filter Cookbook are among some that I remember. He also had articles in most of the hobbyist magazines and had many suggestions regarding what to become involved in regarding electronics. Great show – enjoyed it very much. Even though I’m a bit older than Dave – I too “was a boy” in the 70s and Forrest’s books from Radio Shack were instrumental in my ultimate career path. Great stuff! +1 on trying to get the Woz on a future episode! I agree that Don Lancaster should absolutely be on this show. He doesn’t mind sharing his works for free and also doesn’t prosthelytize. I read mims as a child and enjoy reading through his works today. Please have Don Lancaster on if you can though. Thanks to dave & chris for an excellent show! I second (or third) that recommendation for Don. As a software guy who which he learned electronics, could you ask your guests on how to learn electronics at this time and age, Arduino is great but it is too digital. This was one of the most inspiring interviews I’ve heard in a long time! Hope you don’t mind, I’ve done a blog post about it on my hypnosis and self improvement blog, with iink back here to this page. Forrest’s incredibly well written books changed a lot of lives.. Thanks Forrest!